Supposedly these can be made ahead and frozen very successfully. I don’t have that kind of self control – if I’m going to make something this fiddly with this many delicious ingredients, I am very much going to be eating them as soon as possible. Because they are delicious! They have buttery, tender crusts with yuca mashed into it and a rich filling that balances the flavors of garlic and shrimp, coconut and chillies, lime and cilantro so none of them overpower the rest. This recipe has a few “exotic” ingredients you won’t find in every American grocery store. But the roots are from Brazil through African influences, so if you have access to either African or Latin American groceries, you may be able to get your hands on them. I keep the yuca in the freezer and the the oil is pantry stuff, so that I can make these rather easily. 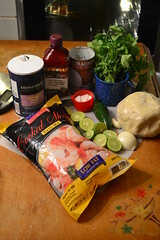 And I’ve taken to using frozen cooked shrimp because it’s easier too. Ingredient note: This was the first time I was able to make them with the red palm oil (which I found in an African grocery store in Chicago) and I loved the difference it made in the color of the filling. The flavor might have been slightly different but not so strong you couldn’t substitute something else. If you want to get the bright yellow color and can’t find the dende oil (as it’s called in my Latin American cookbook) you could see if Annatto oil is more possible (fry annatto seeds in olive oil, then strain out the seeds). Or just use olive oil, they’ll still be delicious. 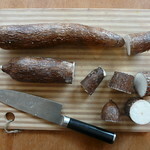 Ingredient Note: Fresh yuca or yucca (sometimes marked as cassava) is a time-consuming veggie to cook – very hard, with waxy covers that have to be chopped at to be removed, then slow to cook and having lots of long fibers down the middle you need to remove before you can use it. Not impossible stuff, but time consuming. 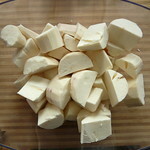 I was very happy when I started using frozen yuca instead – easier to microwave, already peeled, not may fibers left in it. 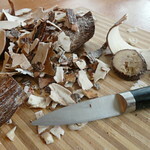 Don’t use a food processor to mash the yucca – anything too vigorous will make it gummy. A fork or potato masher is fine, but keep a light hand with it. It’s ok to have to pick a few chunks of veggie out of the dough later but still have a tender dough. When you have the yuca mashed, then cream the butter in a mixer and add in the flour with the mashed yuca to get a soft, smooth dough. Let it rest for 30 minutes or put it in the fridge – but don’t try to use it chilled. It will need to be room temperature to roll out because it has so much butter in it. 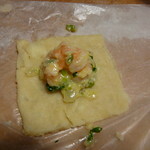 Mix together the lime juice and chopped shrimp while you get the rest of the filling ingredients together – let it sit for about 15 minutes. 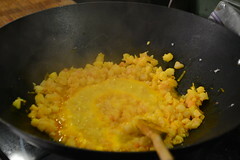 Cook the onion & garlic in the oil (see the ingredient note for substitutions, if needed) and cook until tender. Add in the shrimp and sprinkle on the flour to begin thickening the filling (I forgot and added it after the coconut milk, which worked but not as quickly). 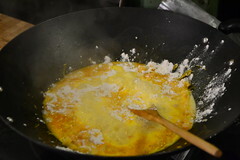 Saute until well mixed, than add the coconut milk and stir until it begins to form a thickened gravy. Add in the jalapeno, salt, and cilantro and set off the heat to cool. Preheat the oven to 400° F. Roll out the dough to an even 1/8″ thickness – it will need to be room temperature to roll easily and you may need to pick out chunks of yuca or patch it as it tears because it is so tender. 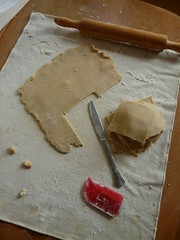 You can easily re-roll the remainder after you cut the 3″ squares. 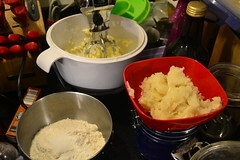 Try to keep track of how may you’ve made as you go so you don’t forget and let the dough get so thick you don’t have enough to use with the filling. 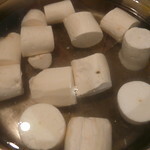 When you have the squares cut, add 1 Tablespoon filling to the squares and fold over to seal. 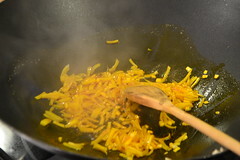 Brush with mixture of egg and water to get a lovely golden gleam to them and bake for 20 minutes. Let cool a few minutes before serving.